Happy Monday friends! It is time to share your favourite children's books.I will share mine in a seperate post later in the week. See you soon. 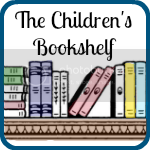 The Children's Bookshelf is co-hosted by What Do We Do All Day, No Twiddle Twaddle, Smiling like Sunshine, Mouse Grows Mouse Learns , Mommy and Me Book Club and My Little Bookcase.